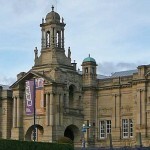 Advising Leeds City Museum – Muslim Museum UK – Uncover the 1400 year relationship between Britain and Islam. Explore the history and heritage of Muslims in Britain. The Muslim Museum Initiative advised Leeds City Museum on their ‘Faith in Focus: Islam’ exhibition for their ‘Voices of Asia’ Gallery. MMi met with Leeds Museums and Galleries Curator of World Cultures, Antonia Lovelace, on a number of occasions and agreed to loan several items for the year long exhibition. MMI advised on engagement, potential activities and events, panel descriptions, display items, and arranged an Arabic calligraphy demonstration for the launch. The exhibition was launched on July 25th 2015 and will be on for one year.